I hope you all had a wonderful Christmas. The best part about Christmas for me is the bright and happy lights, decorations everywhere and not to mention, the delicious plum cake 😋. I like to go out in the evenings and night during this time as everything is so colorful and lively. I have never had a Christmas gift before since we don’t celebrate it at home. 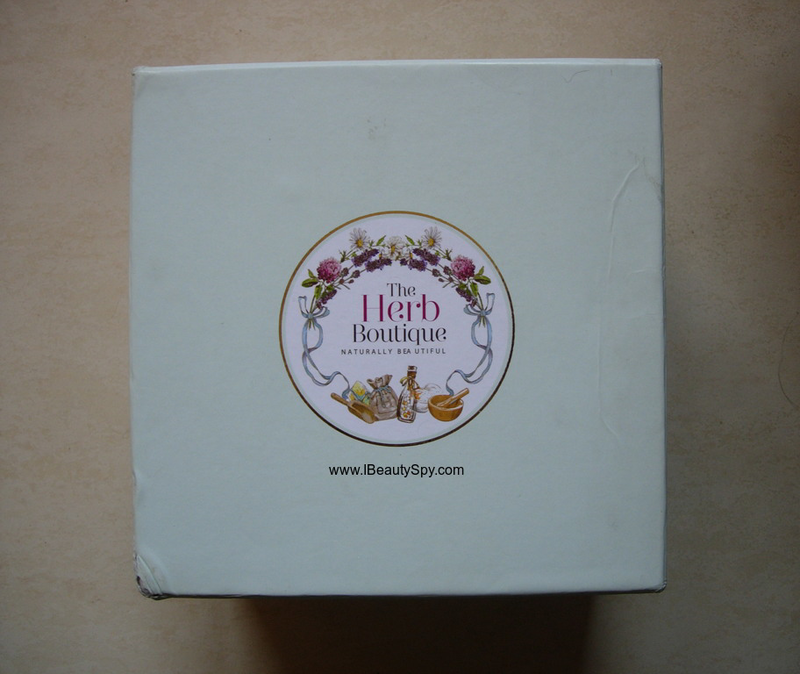 But this Christmas was extra special for me as I received a big beauty box from the brand The Herb Boutique. Thanks to the brand for sending me this as I was super happy. The Herb Boutique was borne out of the desire to provide a range of product that people will be proud to be associated with. We value every penny you make and would not be happy to see you spend it on poor quality product in the disguise of quality. We only work with manufacturers who produce with nothing less than 100% organic products. We love animals and promise that all our products were made without harming animals. We understand we are in a competitive environment where the need to make profit has outweighed the moral obligation to provide nothing short of the quality. This is where we are different. We will not compromise on quality for profit making. Every one of our product is a symbol of our integrity. Our word is our bond and we value that more than anything else. The Herb Boutique has also taken into cognisance that as the years go by and changes happen, so are the tastes and preference too. We are dynamic and wish to improve our products, especially when it is all about keeping the promise we made to you. Again, we emphasise that we will not compromise on quality for whatever reason. We delight in maintaining a good reputation and will always leave our door open to you for suggestions. We will give a listening ear to your concerns and complains. We will be fair in our dealings with you. Bear in mind that whatever we say we will do, that we must do. We are living in a world where we have come to the awareness of the cruelty caused by humans on animals and their products. This is not good for the ecosystem and in many cases not good for humans as well. It may appear cheaper and more convenient to use animal products in the short term, but in the long term, it always affects nature and invariably us as humans. Efforts have been ongoing to ensure that those that believe in vegan products have access to it at no extra charges. This is why we are part of the people championing the need for vegan beauty products. Our vegan range of products are made with no animal product or by-product. No animal was put in harm’s way for us to get the ingredients we need to make our products. We are all about natural ingredients that are 100% vegan and proudly so. When you buy any of our vegan beauty products, you buy peace of mind. We assure you of nothing but the very best of beauty products made with only pure vegan products. We have your concerns covered. Our word is our bond. I love the fact that all their products are authentic organic products. Also the brand is cruelty free. The best thing that I loved about their website was, beside every product they have tagged whether it is vegan or vegetarian. And apart from honey and honey-based products, most of the others are vegan. Am a strong believer of vegan products – both in food and beauty. But its tough to find vegan products as the trend is just now starting. The Herb Boutique is way ahead in the trend and makes it easy for people to buy pure vegan products. I wish more brands pick up on this. The box is really big and the packaging of all the products are great. This can be a perfect gift to someone. 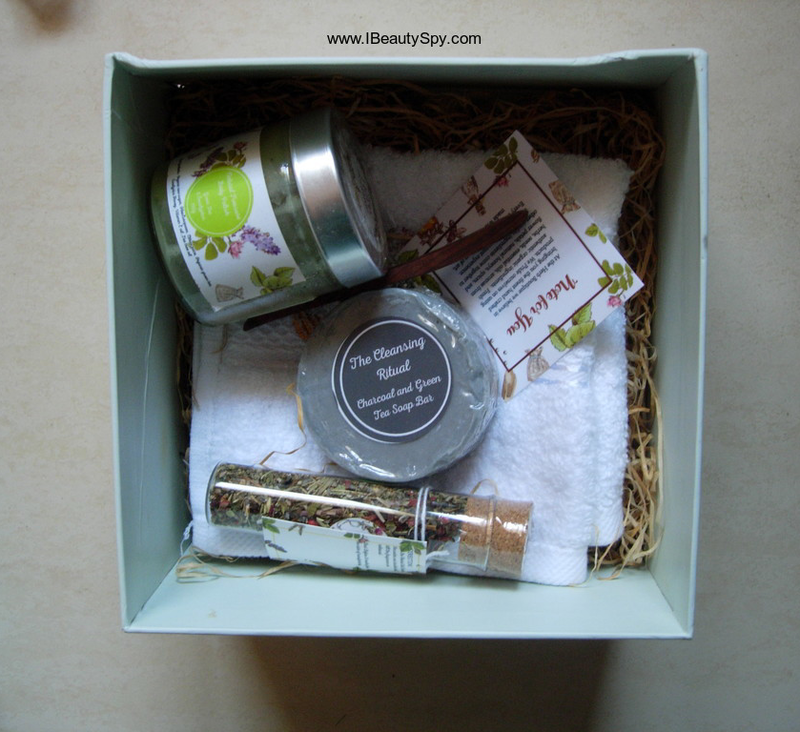 If you are looking for a new year gift to someone, you can now order a gift box from their website where they have 15% offer going on right now. Natural Treasure Body Polish is made with specially handpicked tea leaves combined with eucalyptus oil and citrus juice to nourish your skin from inside out. Indulge your skin in this rich body polish. 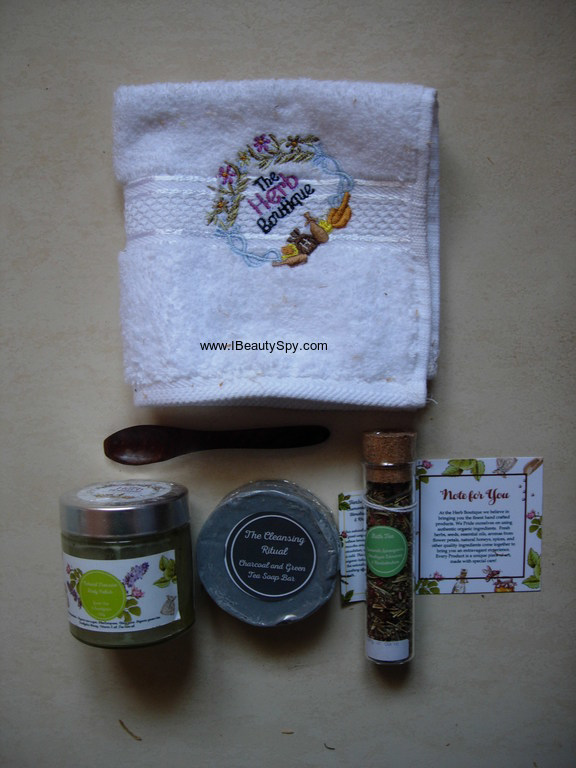 Key Ingredients: Organic raw sugar, Citrus juice, Organic green tea, Eucalyptus oil, Vitamin E oil, Tea tree oil. I love the smell of eucalyptus and its warming scent is perfect for winters. I think this body scrub would make a relaxing and rejuvenating bath experience. I have never come across a bath tea before. I didn’t know whether it was meant to be used like a bath soak or like a tea for drinking. When I got in touch with the team, they said its similar to a bath soak. But unlike the particles or powder in a usual bath soak, this comes in a tea leaves form. An interesting product definitely! Am going to try this soon. The soap comes in round shape and am really impressed when I read the above description that the green tea has been steeped for 24 hours for maximum benefit. Both the ingredients – green tea and charcoal – are highly beneficial for the skin. Apart from these, I also received a wooden spatula and face towel 😀. The packaging of all the products is really awesome and makes it look like a luxury brand. I will post reviews of individual products that I have received soon. So stay tuned! All the products seem to be amazing! These products seriously sound droolworthy. Didn’t hear about this brand earlier. Great post! Looks like a great bunch of products….